Australians are, as you may know, avid mobile phone users. What are we doing with those smartphones? Recent data has shown where our interests lie - and just how important mobile really is to our digital experience at this point. The big number in the data is 138%. That is the amount that mobile searching has increased in popularity over last year's data. This number has a direct relationship to the increasing number of smartphones in consumers' hands as older mobiles are phased out. The ease of access to information afforded by all those smartphones puts tremendous research power in our hands - and we are using that power to research products that we like and find information on the go. We're even using it to put down the occasional friendly trivia debacle down at the pub (you know you've done this)! At every level, the Internet is becoming more closely integrated into our daily lives. The next big number is the number of Australians who never separate themselves from their smartphones - totalling 74%. Coming in at 63%, travel also figures heavily on our minds - particularly on the weekends. 40% of shopping-related Google searches now stem from mobile devices. Around a third of all mobile searches are for local information, such as local restaurants. What this data adds up to is a changing depiction of the average Aussie. We do love our sports - and the occasional barbeque - but we're also riding the digital wave of mobile shopping and an online-integrated life. We're spending upwards of 20 hours per week using the Internet, and mobile devices feature prominently as vehicles for our digital usage. We use our mobile phones as a fluid extension of our lifestyles, and the trend is growing - going by the numbers. Australia is growing and is leading the charge when it comes to digital access and consumption. From product discovery, to shopping, to trivia, we're arming ourselves with plenty of the information (and communication) afforded by our handheld devices. How are you using digital devices in your daily life? Is your living room a multi-screen viewing environment? 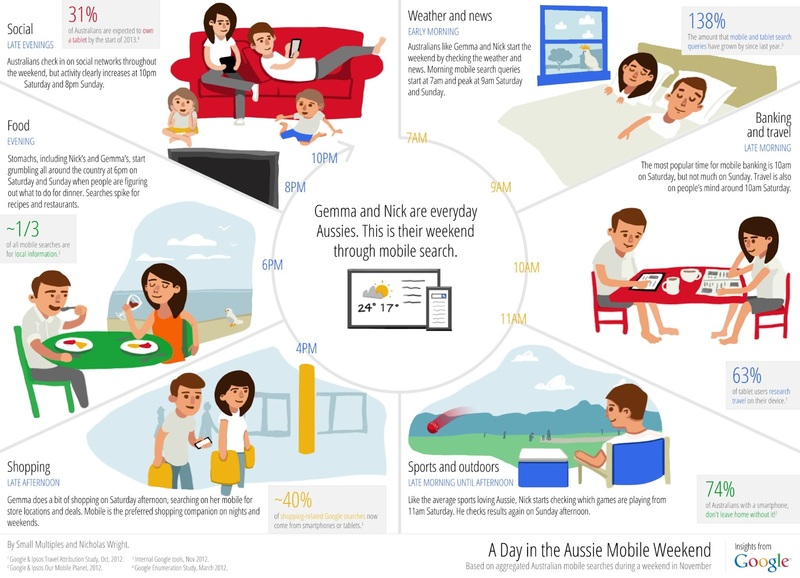 Compare your experience to the figures above and we're pretty sure you'll conclude that high digital usage is effectively a part of life in Australia. Given the always-on nature of mobile, it's easy to start imagining the possibilities available as our population continues to grow and new technologies emerge.